Sometimes I come across an image so compelling it would be a crime not to share. While usually I only ever post photos that I have personally taken, today is an exception to my own rule. Some of you may have already seen this photo today floating around the internet. 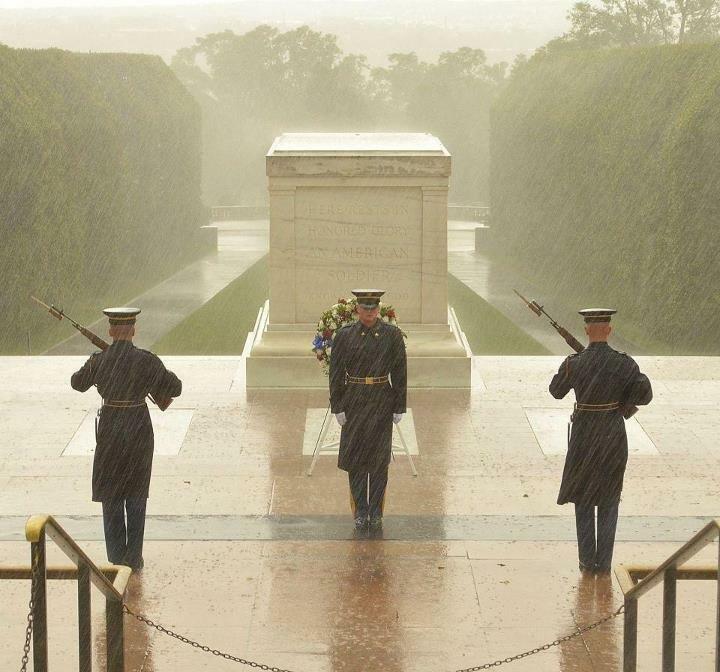 As the entire East Coast of America bunkers down in the face of Hurricane Sandy, the Sentinels standing guard over the Tomb of the Unknown Soldier at Arlington National Cemetery continue on with their task. For them it is not a job but the highest of honors. To the rest of the country it is a message. The Sentinels live by their creed which in part says "Through the years of diligence and praise and the discomfort of the elements, I will walk my tour in humble reverence to the best of my ability". The Tomb of the Unknowns have been guarded continuously 24 hours, 7 days a week since the first guard was posted in 1937. No amount of inclement weather, terrorist attacks or anything else will cause the watch to cease. While this photo dates back to September 2012, it's important to note that today, right now this very instant the Old Guards are still there manning their post. They have the option of seeking refuge within the Trophy Room which overlooks the tomb but I have a feeling these dedicated men will remain guarding the tombs. If you have never witnessed this in person, I highly recommend that you do. It is an incredibly sobering experience and will put into perspective all those minor trivial things in life. To all those in Sandy's path, stay safe! I could not agree more, this picture is incredibly moving! I didn't know about this tradition. This is very impressive. I've been following the news about Sandy. I hope that it will be over soon with as little damage as possible. I was just looking at this photo. The images from NYC are breaking my heart. Luckily my sister is ok, she's on the upper east side but so much of the city is under water it's so sad. Keeping them all in my thoughts. So random, my post today is about images that are so emotionally compelling as well. It's hard to ignore photos that speak a volume of words. "The tomb of the Unknown " touched me in many ways...I too had the experience of visiting a cemetery in my country where there are tombs of unidentified soldiers..when I first saw them, I was moved to tears...I later thought about whom they left behind..and what their hopes and dreams were with their family and loved ones. They protected and saved the lives of many by giving up their own lives. I salute the spirit of these brave souls, May God bless their souls forever. Great pic! like you said it`s an honor for them, that`s why the will keep watching no matter what and that is admirable. Nothing like rain or shine and this is def an image to share. Those of us wo have never been on the service have no idea what these people in the military sacrifice. Jenee, this image touches me so much. I'm so glad you posted it. Cadets came to my father's funeral and played Taps in the blustering cold--nothing like the rain in the image, but the dedication and respect paid still moves me if I think about it. Hope you are safe and cozy today whatever you're doing! I have heard about this. It's a very moving post Jenee. I love it. It makes me think how I complain about my work sitting in a desk by the window and warm and look at these men rain or shine, hot or cold and they are out there. These men in uniform deserve more than what they have to gave up for service to keep us all safe. Very impressive! I never knew about that! Thanks for sharing! This is so amazing.. I heard about it and i was really surprised.. Hope everyone is safe.. I'm struck by this photo and your accompanying message...Thank you for sharing this! Wow. I have not visited the Tomb yet, but as several of my family members and friends (including my hubby) are in the service, it is high on my list! Yes I'm quite aware that it wasn't taken during Sandy, I've noted it in my accompanying message. A lovely and thought-provoking post! This is my favorite photo from the storm! Thank you for sharing! Totally agree with you! What a beautiful serene picture! P.s. Thanks for the lovely comment on my blog, hope to see you back :)! This is a gorgeous dedication to those guarding the tomb. Thank you for the reminder of how trivial most things really are. this photo is truly beautiful! thankyou for sharing. What an incredibly moving picture…thank you for sharing! This picture is so lovely and moving. What an amazing moment captured. I'm thrilled you stopped by my blog because now I found you! Following you now so I can stay up to date. Excited to see more inspiration darling! I would be so happy if you stop back by mine love! I LOVE LOVE LOVE this photo. Saw it on the news, and it just made me so so proud. What a heartwarming and touching post. I was a little teary eyed reading it. Thank you so much for explaining this because I, too, thanks to my ignorance would think nothing of this nor understanding the meaning of their action. Wow! That speaks a LOT! It shows the dedication and how much it means to them and everyone else. So remarkable! I'm trying to remind ones that are going through Sandy who loss power to think of the one's who have lost everything. I live in New Orleans and we go through this a lot. I'm always thankful when I have a home to go to. Several days without power is discomfort, but when you lose pics etc That is irreplaceable. Great post Jenee! Thanks for sharing! This is so touching and seriously makes me think about the sacrifices people make for our country. Never heard about than sentinels before bit is truly heartbreaking! I hope everything goes back to the usual as soon as posible with the power and so on. Thanks for sharing this beautiful images with us.